It's Valentine's Day - a day when people break bank to show their love. Here's the thing, you don't have to break bank in order to show your love - or save a child with t1 diabetes. 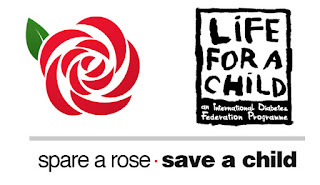 For $5, the cost of one rose - you can provide one month of lifesaving insulin, blood glucose tools, and life enhancing diabetes education to a t1 child in a developing country. Many children living with t1 in developing countries don't have access to all of the above. To learn about Spare A Rose, lifeforachildusa.org and to #sparearose and make a donation, click HERE. No child should living with diabetes should die because they don't have access to life saving insulin, diabetes supplies, and diabetes education. Be the the change you wish to see.